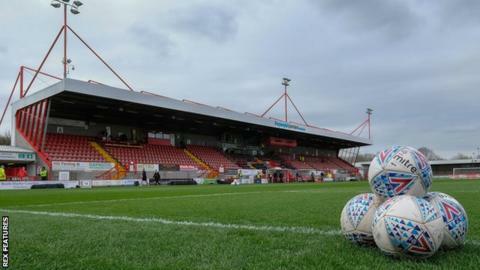 League Two club Crawley Town have banned a fan from their remaining home games this season for sending homophobic abuse to a member of staff. The supporter posted the message on Twitter following Saturday's 2-1 defeat by Forest Green Rovers. The Reds say the individual is "not welcome" at The People's Pension Stadium for their final two home games. The West Sussex club have lost their past four matches, but are six points above the relegation zone. "Abuse of anyone at this club, be it staff, players or supporters, will not be tolerated," said a statement on the club website.